Practice what a security check might be like for your dog. Often security folks will pat your dog down. Ask them not to pet or play with your dog. I took one young puppy who got super excited when the security folks played with her. It took me a good 10 minutes to calm her down so that we could walk gracefully to the gate. 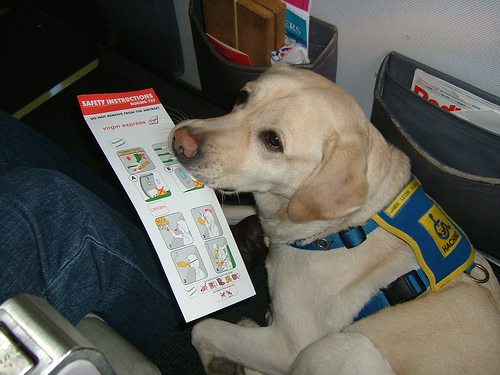 Be sure the airline knows you have a service dog in training coming along. Get your vet certificate. Most airlines require a vet certificate of health. It’s usually only good for 14 days so you have to plan your vet visit and trip accordingly. Tell them not to place you in a bulk head. Airlines love to give you the bulk head seat when you have a service dog. The problem is, there’s no where for the dog to lie down! In a regular row, the dog can partially fit underneath the seat in front of you, giving them (and your seatmates) a bit more room. Get there early. It may take you longer to check in and get through security. Plan potty breaks. Ask the airline agents for help. During one four hour delay, the agents in the Red Carpet Club actually took my puppy out on the tarmac for me. (I couldn’t go out there, but they could take her out.) On other occasions I had puppies go on paper in the bathroom floor and then cleaned it up. Use the chance to educate people. Many people will come up to talk to you about your dog or ask if they can pet it. Use the opportunity to explain what you are doing and what service dogs do. Any other tips you would add for people traveling with service dogs? Any questions? ← Should you trim your dog’s whiskers?